George Washington was born on February 11, 1732, in Westmoreland County, Virginia. His father Augustine died when he was just 11 years old. As a result, he was raised by his mother, Mary, on their Wakefield plantation. George received the equivalent of an elementary education. However, he was an avid reader his entire life. In 1749, George took a job working as an assistant surveyor. He learned quickly, and the following year staked out a claim for 1,450 acres. Following the death of his father, his older brother Lawrence inherited Mt. Vernon. At the same time George inherited an additional 4,000 acres. George idolized his older brother who had become his mentor. Sadly, Lawrence would soon become ill from tuberculosis and die. At that time, George leased Mt. Vernon from his sister-in-law, and then she also died, and he became the owner. Under George's ownership, Mt. Vernon would eventually covered 13 square miles. George Washington was an intimidating sight. He was 6 foot 2 inches, with wide shoulders, long legs and arms, with a sculpted face. His horsemanship skills were legendary. In 1753, George led a military mission into Ohio. He was there to warn the French that they needed to leave, but they didn't want to go. The next year George returned. Only this time he led 159 British soldiers into Ohio. From the very moment they entered the Ohio Valley they were fighting the French. However, Washington lost when he made a crucial mistake. He constructed a fort in a flood prone area, calling it Fort Necessity. Unfortunately, when the French attacked, it rained and the fort flooded, forcing Washington to surrender. 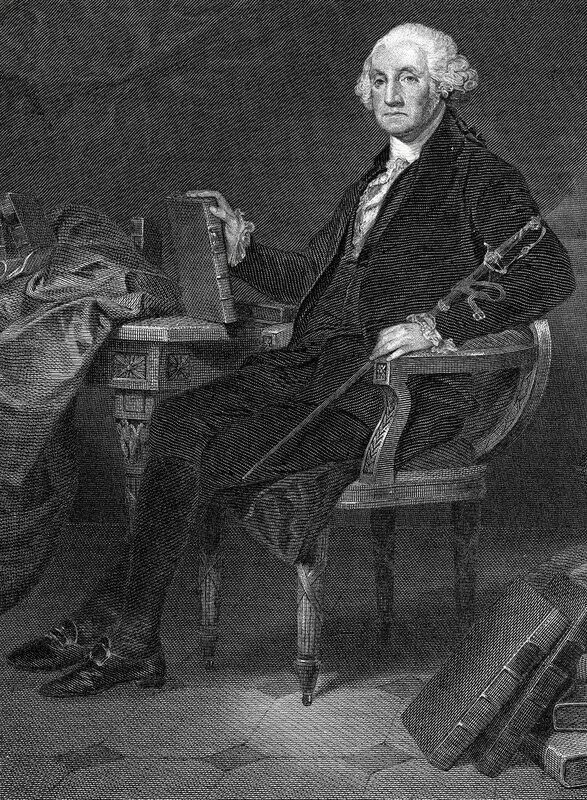 George served in the Virginia legislature's House of Burgess for 15 years. Then in 1759, he married Martha Dandridge Custis, the wealthiest widow in Virginia. Next he served as a delegate to the Second Continental Congress, soon afterward became commander in chief of the Continental Army. At the time the army was in chaos. George immediately got rid of many of the officers before finally achieving discipline. Between the summer of 1776 until the summer of 1778, George Washington fought 7 battles and was victorious in 2. In 1787, he was selected as a delegate for the Constitutional Convention. Then just two years later, George would be elected President of the United States. At the time, the Washington's owned 168 slaves. During his entire time as president he never questioned the act of slavery. From the very moment George Washington became president political disputes erupted with Thomas Jefferson and Alexander Hamilton. Hamilton introduced a complex financial plan that few understood. He proposed that the national government assume the states war debt. He also proposed that the debt be funded, which meant that the states were going to have to pay a federal tax. The southern states didn't like Hamilton's proposal because most of the war had been fought in the north and the debt was largely owed by the northern states. This passed when congress agreed to move the capital south to its present location. Hamilton also introduced legislation establishing a national bank, which Washington approved. When war again broke out between France and Great Britain, in 1793, President Washington declared neutrality. He knew that the new nation couldn't endure more war. At the time, America was on very fragile soil both financially and militarily. Washington would pass away just 2 years after the end of his second term, on December 14, 1799, at his home at Mt. Vernon. April 30, 1789, George Washington was inaugurated at Federal Hall, New York.